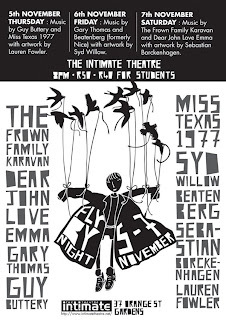 I've made another poster, this time for the Fly By Night event. It's spread over 3 days and each night one artist will exhibit and 2 bands will play. Each night will be an absolute treat to the senses! Tickets are R50 per night. I'm exhibiting on the Thursday the 5th of November and you'll be entertained by Guy Buttery and Miss Texas 1977!